If you have a spare few hours, a journey along the Canal Saint Martin is a great way to see a more realxed side of Paris. You can walk the canal tow paths and visit the cafes on route, but we found the boat trip through the locks a better experience. Canal St Martin is 4.5km long and there’s plenty to see along the route. We found the biggest highlights are the attractive locks and bridges along the way which appeared in the film Amelie. On a sunny day, you’ll find the water is a magnet for those wanting to soak up the sun. There will be loads of people dangling their legs over the quay. The restaurants and cafes on each side of the canal are also busy when the weather is fine. When you’re travelling on the canal, spare a thought for those Parisans who had to have a tax on their wine in order to pay for it back in the early 1800s! The 2.5 hour boat trip we took was run by Canauxrama, a company which operates regular services all year round on the canal. 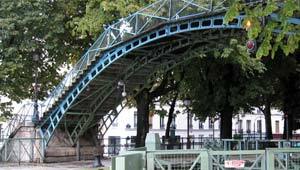 You can take the trip from either the Arsenal Marina (next to the River Seine) or from Parc de la Villette. Adult tickets cost 16 Euros (2012 prices) but to get the best value for your trip along Canal Saint Martin, look at the combined ticket with the Seine River Cruise – latest prices are available here. The cruises along Canal Saint Martin begin at the Arsenal Marina quay along Boulevard de la Bastille and terminate at Bassin de la Villette, or you can take the trip the other way round. The nearest Metro stop to Arsenal Marina is Bastille.